Members of the International Lutheran Society of Wittenberg meet at the Luther Hotel in Wittenberg, Germany, tour the reconstruction work at the Old Latin School in the city center, and visit the Luther House. On Wednesday, 29 January 2014, the International Lutheran Society of Wittenberg (ILSW) met in Wittenberg, Germany, to discuss the ongoing reconstruction of the Old Latin School. The LCMS Office of International Mission (OIM) area facilitators also were able to join the ILSW for a tour of the construction site. LCMS President Matthew Harrison, SELK Bishop Hans-Jörg Voigt, and the Oberbürgermeister of Wittenberg Eckhard Naumann discuss the reconstruction of the Old Latin School. Pastor Michael Kumm, chairman of the ILSW, conducts the meeting. Bruce Kintz, President and CEO of CPH, Rev. Dr. Lawrence Rast, President of Concordia Theological Seminary and Chairman of the CTCR, and Mr. David Rohe, executive director of CID CEF, listen to the update on the project. The reconstruction of the main room which will serve as the chapel in the reconstructed Old Latin School. The main beam has warped approximately 6 inches over 400 plus years. The Old Latin School being reconstructed next to St Mary’s church in Wittenberg. Today, President Harrison put on his World Relief and Human Care uniform and visited a center for mentally disabled children in Mekanissa. The total number of children assisted is 372. Prior to the center’s founding in 1986, mentally disabled children were hidden away in dark rooms — their very existence was denied. The German Lutheran theologian Oswald Bayer said that to be justified is to be recognized. In some cases, the recognition of people, in this case, the human care for the children brings them into contact with the church so they can hear the Gospel. A variety of techniques are used to train the children in life skills. The boy above is being taught in a Montessori way. A boy learning how to tie his shoes. A young man learning how to make coffee. Some at the center learn marketable life skills. The children above are baking communion hosts for the church. President Harrison greets a diary cow who has an infected foot. The center for disabled children receives its milk from diary cows kept on the facility. The facility keeps incredibly good records. We said goodbye the children, deeply moved and impressed by the care they receive. Before we left we visited the library to see a 19th century Ge’ez document which sought to reform the Ethiopian Orthodox Church by teaching on the Sacraments and justification. The Mekane Yesus Seminary (MYS) has the Ge’ez and Amharic versions in their library. There are plans to produce a triglotta version in Ge’ez, Amharic, and English. President Harrison with Mihreteab, the librarian at MYS, examining the Ge’ez manuscript. We look forward to visiting Ethiopia again. ST. LOUIS, January 27, 2014—Representatives and leaders from the Ethiopian Evangelical Church Mekane Yesus (EECMY) and The Lutheran Church—Missouri Synod (LCMS) met at the Mekane Yesus Seminary, the EECMY headquarters, and the Gudina Tumsa Wholistic Training Center in Addis Ababa, Ethiopia, Jan. 23 – 26, 2014, to discuss the relationship between the two church bodies. Those meeting included the Rev. Dr.Wakseyoum Idosa, president of the EECMY; the Rev. 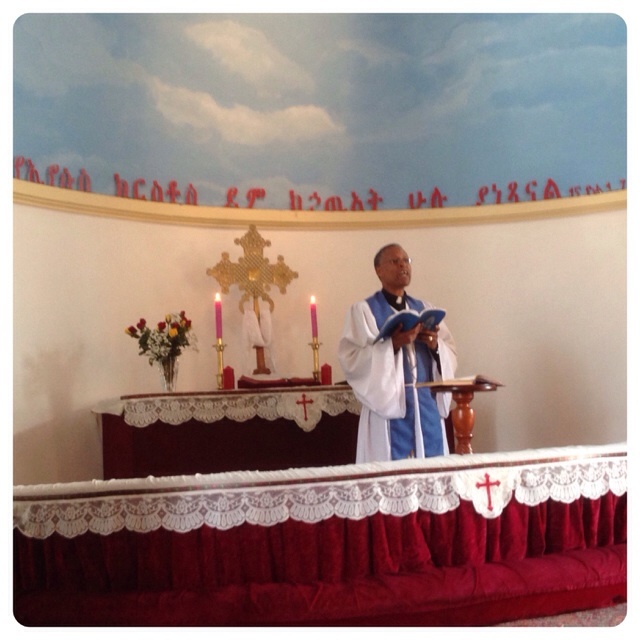 Dr. Berhanu Ofgaa, general secretary of EECMY; the Rev. Dr. Matthew C. Harrison, president of the LCMS; the Rev. Dr. Albert B. Collver, LCMS director of Church Relations and Regional Operations; and LCMS missionaries the Rev. Dr. Carl Rockrohr, Dean of the School of Theology at Mekane Yesus Seminary, and Deaconess Dr. Deborah Rockrohr. Although the churches have diverse histories and developed in different contexts, the EECMY and the LCMS have discovered that both church bodies believe that the Holy Scriptures are the Word of God and the only source and infallible norm of all Church doctrine and practice. Both churches also subscribe to the Lutheran Confessions. Although the two church bodies recognize they have differences in doctrine and practice in certain specific areas, both believe that the common confession they share about the Holy Scriptures and acceptance of the ecumenical creeds, the unaltered Augsburg Confession, and the Small and Large Catechisms justifies, even demands, that the two churches engage in more formal discussion regarding areas of agreement and disagreement. As an outcome of the meeting, the EECMY and the LCMS agreed to appoint a three-member team from each church body, along with the church bodies’ respective presidents, to begin formal doctrinal discussions. This six-person team, plus the two church body presidents, will begin doctrinal discussions within the next nine months and have the authority to form other ad hoc committees for particular topics as needed. While the church bodies engage in dialogue, both will look for areas where they can mutually support one another. The EECMY was formed in 1959 as various synods started by several different mission societies merged into one church. In the 1970s the EECMY developed the theme “Serving the Whole Person,” now often quoted and referred to as holistic ministry. This has been a guiding principle for all evangelistic or developmental church work. Beginning with 20,000 members in 1959, the EECMY has grown to 6.35 million members. Learn more at http://www.eecmy.org. The Lutheran Church—Missouri Synod, founded in 1847, is a biblical, confessional, witness-oriented Christian denomination with 2.3 million members – 600,000 households – in 6,200 congregations. Through acts of witness and mercy, the church carries out its mission worldwide to make known the love of Jesus Christ. Learn more at www.lcms.org. Today we visited the Addia Ababa Evangelical Church Mekane Yesus, more commonly known as the Mother Church. 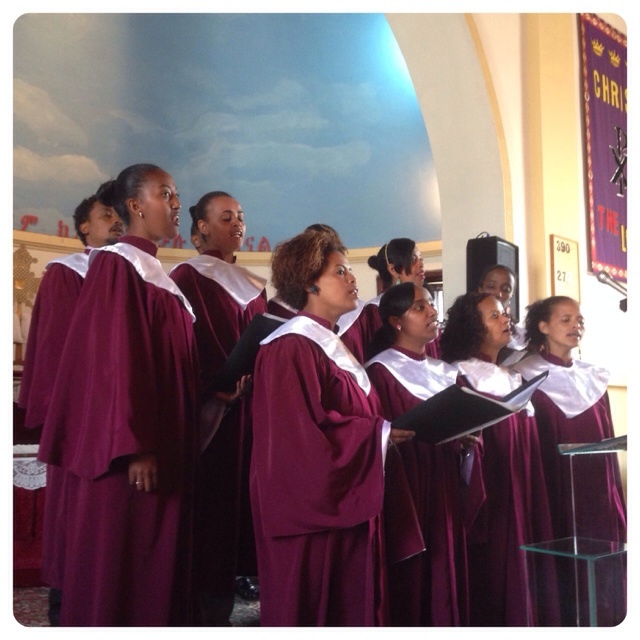 The pastor was vested and conducted the liturgy in Amharic. The liturgy is based off of the Lutheran Swedish liturgy. A page from the EECMY hymnal. 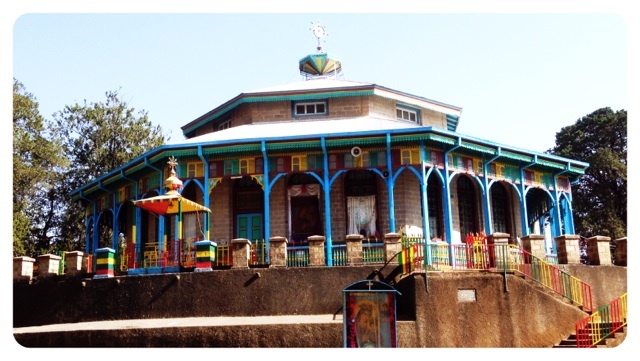 It is written in Amharic, which is the second most spoken Semitic language in the world after Arabic. The church was full. 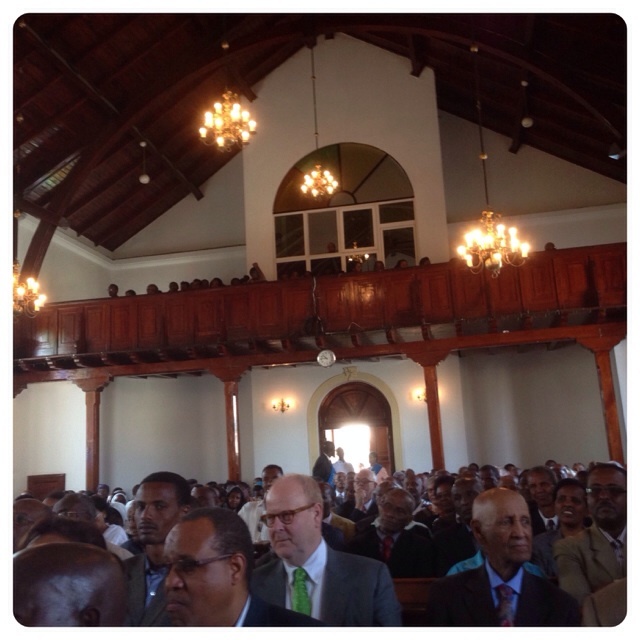 A number of expats from America and Scandinavia attended the service. After the service, church and congregation leaders gathered with us and other visitors for a photograph. 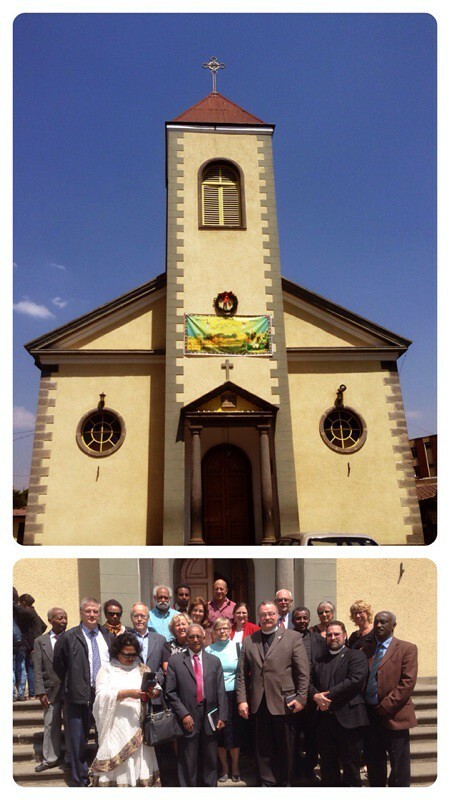 After lunch, we visited the Entoto Maryam Ethiopian Orthodox Church.